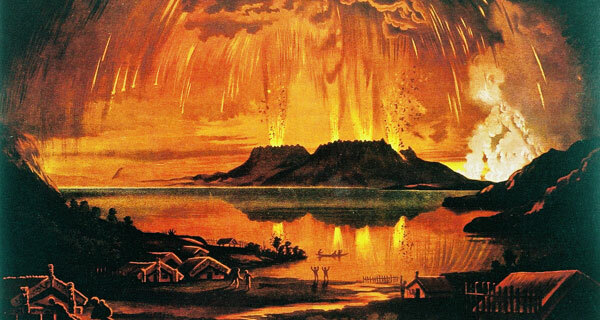 In 1886 Mt Tarawera, east of Rotorua, erupted. Albert Benner was the Telegraphist at Maketu, and his observations were recorded in the Official Reports. At Maketu, the dust began to fall at 4.30 a.m., and the air was full of it at 1.30 p.m. Depth of deposit, lin. A slight appearance of daylight at 6.50 a.m., but total darkness from 6.55 till 9.45 a.m., and more or less dark till 1.30 p.m. when the sun was first seen. Strong electrical disturbance noticed on the 16th April and 3rd, 5th, 10th, and 14th June. On the 5th June very strong, and lasting from 9 a.m. until 12.10 p.m. The telegraphist, Mr. Benner, who kindly supplies the above, says, " I had never seen anything so continuous as the electrical disturbance on the 5th until the 10th June, when the wires became altogether unworkable from 5.50 a.m. until 9.50, and continued later but not so strongly." In the early hours of June 10th 1886, the people at Te Wairoa were woken by earthquakes and continuous rumblings. Moments later, Mount Tarawera violently erupted, spitting out hot mud, red hot boulders and huge clouds of black ash. Several hours later, the bed of Lake Rotomahana blew out, burying the Maori villages of Moura and Te Ariki under a deep layer of liquid mud, stones and ash. Just days before the eruption, a phantom canoe or apparition was seen on Lake Tarawera by both Maori and European tourists. When the great Tohunga (priest) Tuhoto was asked what it meant, he replied that is was an omen. He believed the waka wairua, or spirit canoe, was an sign of a great calamity that would strike the land. Tuhoto believed the local people had desecrated their sacred mountain and values. And two days after the sighting, Mt Tarawera erupted. 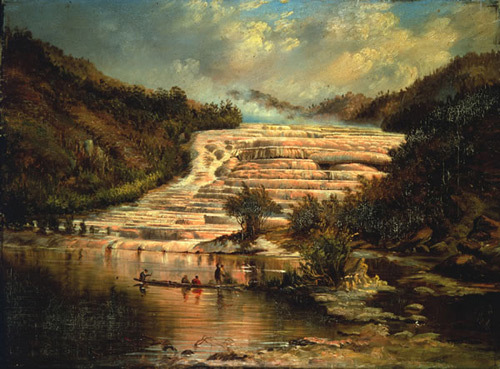 The Pink and White Terraces were destroyed and 153 people lost their lives. Rotorua is very close to the place where great tectonic plates meet; the land has been moving here for thousands of years and continues to do so. Deep in Tarawera Mountain the pressure builds. This mountain merely sleeps. Scientists constantly measure volcanic activity and keep an eye on the restless earth for signs of the next eruption. These beautiful wonders of nature where destroyed by the eruption of Mt Tarawera. A hundred and twenty years have been and gone since the biggest volcanic eruption in New Zealand’s history claimed the thermal wonder that was the Pink and White Terraces. But now, for the first time since 1886, tourists will have the chance to marvel at the shimmering terraces once again, thanks to a combination of man's handiwork, and the touch of Mother Nature. The original terraces, often referred to as New Zealand's eighth wonder of the world, were said to have risen like a giant wedding cake from the banks of Lake Rotomhana. Formed over thousands of years, they are now set to be rebuilt, with a man-made staircase being constructed 80 km from Mount Tarawera. The company undertaking the building of the new terraces will also be constructing a geyser that will pump silica-rich water from a geothermal power plant at Wairakei. The geyser will pour super-heated water cascading over the newly-built terraces that will stand some eight meters high, and should recreate the beauty of the scenery that was lost when Mount Tarawera erupted, and the surrounding area was engulfed in ash and lava for miles around. Beyond the work being carried out by man, nature itself is playing an equally important role in recreating the incredible hues of pink and white that made the original terraces such an incredible spectacle, and the good news is that after only a year, they are already assuming the striking colours that will make for a stunning scene in the years to come.